Kourou, French Guiana, Dec. 19, 2000 – ASTRA 2D, a high-power Boeing 376 satellite built for SES of Luxembourg, was successfully launched today on board an Ariane 5 rocket from the Guiana Space Center on the northeastern coast of South America. The satellite was built by Boeing Satellite Systems, Inc., (BSS), a unit of The Boeing Company (NYSE:BA). 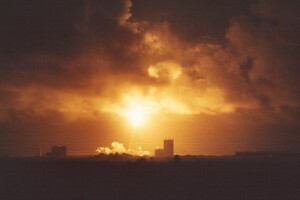 approximately 110 minutes later at the Belrose satellite tracking station in Sydney, Australia, confirming that systems are operating normally. The first Boeing 376 model spacecraft built for SES, ASTRA 2D is the eleventh satellite in the SES fleet and the eighth BSS spacecraft built for SES, operator of Europe’s leading ASTRA direct-to-home (DTH) satellite system. ASTRA 2D will deliver digital DTH services to Great Britain and Ireland from the 28.2 degrees East longitude orbital slot. Two additional ASTRA satellites being built by BSS are due for launch before mid-2002. ASTRA 2D carries 16 active Ku-band transponders powered by 39-watt traveling wave tube amplifiers (TWTAs). The satellite’s power is derived from two telescoping cylindrical solar panels manufactured in Sylmar, Calif., by Boeing’s Spectrolab, Inc. subsidiary. In orbit, ASTRA 2D will weigh 1,816 pounds and measure 26 feet 2 inches tall and 7 feet 1 inch in diameter with its solar panels deployed. ASTRA 2D is designed to have 1400W of power at end of life. Now with 11 satellites at the orbital positions of 19.2 degrees East and 28.2 degrees East, SES’ ASTRA system transmits in analog and digital more than 1,030 different television and radio channels as well as multimedia and Internet services to an audience of more than 80 million homes in Europe. SES is also a strategic investor in the leading Asian/Pacific AsiaSat Satellite System (34.13 percent since January 1999), Scandinavian Sirius satellite operator Nordic Satellite Company NSAB (50 percent since October 2000), and Brazilian Embratel Satellite Division, operator of the Latin American Brasilsat system (19.99 percent, also since October 2000). BSS is the world’s leading manufacturer of commercial communications satellites and a major provider of space systems, satellites, and payloads for national defense, science and environmental applications. The company was formed in October 2000 when The Boeing Company acquired the Hughes Electronics satellite manufacturing companies, which included Hughes Space and Communications Company, Hughes Electron Dynamics, Spectrolab, Inc., and Hughes Electronics’ 50 percent share of HRL Laboratories. The Boeing Company, headquartered in Seattle, is the largest aerospace company in the world and the United States’ leading exporter. It is the world’s largest manufacturer of commercial jetliners and military aircraft, and the largest NASA contractor. The company’s capabilities in aerospace also include rotorcraft, electronic and defense systems, missiles, rocket engines, launch vehicles, and advanced information and communication systems. The company has an extensive global reach with customers in 145 countries and manufacturing operations throughout the United States, Canada and Australia.